There is no big surprise in the proposed budget for 2018-19 fiscal, rather there are several what I would best dub as “inconsistencies.” As a continuation of previous year’s budgets, a large budget had been announced in this financial year as well. While along with numbers, there was a natural expectation that a proper interpretation and implementation plan would be announced along with it. Unfortunately, I don’t find any there either in the budget speech or in the following discussions. To finance this big budget, the primary source is of course the tax revenue. However, a great success in tax collection, which can be called as “a regime change”, has never happened in Bangladesh. We are stuck at around 16-17% growth in the tax-revenue per year. Against such backdrop, a stipulated target of 30% tax collection growth for the fiscal year 2018-19 is not realistic at all. The fact is, even though such an ambitious target is set, the kind of reforms that we need are not in motion yet. Though some improvements have been made, but those are not enough. There has not been any major change in the tax structure and any notable improvement in the efficiency of those who collect taxes. It is quite a challenging task to expand the tax base in a short time. In fact, we have not seen any success in expanding the tax base in recent years. The implementation of Value Added Tax (VAT) Act and the Customs Law has been deferred. However, implementations of these laws are expected to bring in bigger dynamism in the economy. The tax-GDP ratio of Bangladesh remains one of the lowest in the world. The important thing is that the size of our budget is still small compared to the size of the budget that we need. The big goals we are talking about, especially the Sustainable Development Goals (SDGs)— require a much larger budget. But the unfortunate fact is, even though relatively larger budgets have been given for a few years, the budget implementation rate is gradually decreasing. In recent years, the budget implementation rate has dropped to around 78-80 percent. There are also questions about the quality of our development projects, as there is a tendency of escalation of time and cost of implementation, and these are long standing problems. In many cases, project proposals are not made in line with the reality. Also, the projects are not being implemented according to the cost and time estimates initially planned. That is why those are needed to be amended time and again during the implementation period which too misses deadline for a couple of times in most cases. The reality is, a large amount of money from the exchequer is being wasted due to such amendments and dillydallying. We also see that every year only 50-52% of the annual development programs (ADP) of the budget is implemented in the first 10 months of the fiscal year and the rest is rushed to be implemented in the remaining two months. The success of implementation of the development projects under the ADP is considered whether money was spent, but not on the quality of spending. Those who are unable to deliver quality outcomes are needed to be brought under accountability and transparency. Unfortunately, it is true that contractors who do poor quality works receive new contracts over and over again despite their poor performances. Political connections and corruption are major reasons behind such patronage. The proposed budget doesn’t tell us whether there will be any effective and precise steps to ensure transparency and accountability in the implementation of these development projects. Now, the implementation of the ‘mega projects’, are also not free from these problems. We are implementing the mega projects almost in the same way we have been implementing other development projects. The efficiency of project management and implementation has not been improved. In this situation we cannot be very optimistic about the successful implementation of this budget. Although the government wants to maintain the status-quo through this budget, there may be pressure for over-spending towards the end of 2018, as this is the election year. There will be efforts to make big development projects visible. In this context, there is a need to keep track of the spending as well as the quality of development works. It should be kept in mind that we have a number of guidelines in front of us. For example, the 7th Five-year Plan and the SDGs. It is expected that in the election year, the government will not deviate from those guidelines. Otherwise, the implementation of the 7th Five-year plan and SDGs will be off-tracked. This will also increase the burden of the post-election government. Therefore, there is a need to ensure the government’s surveillance in implementing projects and programs, and to increase the efficiency of project implementation. The government is likely to be in a tightrope in implementing this fiscal’s ambitious budget in the first six months. There are few persisting critical problems in our economy of which effective solutions are yet to be chalked out. For example, there has been a major problem in the balance of payment, and there is an unwanted instability in the banking sector. There is also a long-term stagnation with private sector investment, and stagnation in job creation. There are no specific guidelines in this budget with respect to the solution of these problems. Now, because of the election year, in the first six months, if there is a lot of attention to the election-driven development projects without focusing on these challenges, then in the next six months it will be more difficulties for the post-election government to encounter them. Seeing the character of the budget of the last few years, the change that is seen is that we have taken some mega projects, but the reforms needed for the economy were not given due attention. Such reforms are needed in financial sector, foreign trade policies, and tax system. It is true that some reforms have been attempted few times in the past, but those could not be implemented. From this we can say that those who have vested interests against such reforms are strong enough and the government has done little to counter these vested interests. More specifically, the crisis in the banking sector is a culmination of the pro-longed structural problems in the banking sector. There are exceedingly high non-performing loans, and frequent scams in the banking sector, which came one after another. This has created a lack of confidence in the banking sector by the depositors. The banking sector is now characterized by weak regulation and monitoring and no visible punishment of irregularities backed by political patronage. Also, lack of independence of Bangladesh Bank intensified the problem. In the budget, there is a big allocation to finance the capital-deficit in the public sector banking sector, which is people’s tax money and there could be a much better use of this money. Also, the favor given to only the banking sector by cutting down their corporate income tax rate doesn’t not ensure whether this sector will be compelled to enhance good governance as well as there will be a reduction in the bank interest rate to single digit. Furthermore, the changes proposed in the tariff and tax rates in the name of protection of certain sectors are not necessarily under any development plan of greater industrialization rather they are ad hoc in nature. 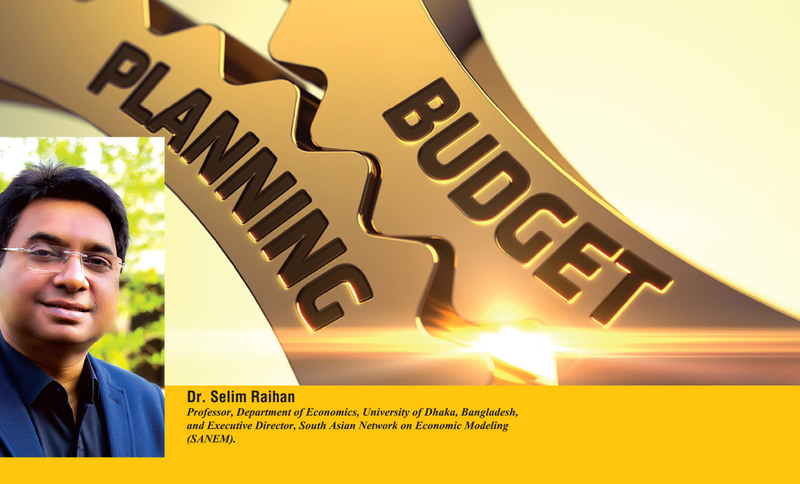 The tax system in Bangladesh is still a revenue-oriented tax policy, not a development-oriented tax policy. There are some good initiatives in this budget, such as increasing the coverage of the social security sector, surcharge on the users of two cars in the metropolitan city and owners in access of 8000 square feet of apartments, and the concept of universal pension scheme. But we are still spending only two percent of GDP as public expenditure in education sector, which is just 0.7 percent in the health sector. But both for the education and health sectors we need public expenditures in the range of at least 4-5% of the GDP. Also, the public expenditure on the social security sector little over one percent of GDP. The budget for 2018-19 has not made any major change in these regards. It is impossible to achieve the SDGs with such low public spending on education, health and social security sectors.